iOS 7 brought several useful features that were missing from the previous versions. But there is always room for improvements. Jailbreak developers are doing their best to bring different optimizations and useful tweaks to the users. 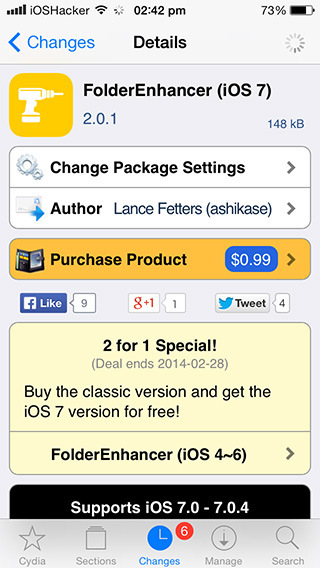 Developer of FolderEnhancer has just released the version 2 of his tweak for iOS 7 devices. Using the tweak you can enhance the way Folders work and look on iOS devices. With this tweak you can have nested folders i.e. folders containing folders, which is something iOS does not support naturally. Also, by default you can put limited apps inside a folder but this tweak gives you freedom to increase this limit. It also allows you to have 3×3, 4×4, and 5×5 apps layout. However 5×5 option is currently limited to iPad only. You can also enable/disable folders animations and wallpaper zooming effect as well. FolderEnhancer 2 supports iPhone, iPod touch and iPad running iOS 7 and is available for $0.99 at Cydia under the BigBoss repo. Users on iOS 6 or prior versions can get the older version. For a limited time the developer of this tweak is offering free upgrade to those who purchase the older version of FolderEnhancer now.